Let me explain in brief about CDP . CDP means Comprehensive Development Plan. This plan includes various factors of present and future growth of a city keeping in mind city’s natural environment and heritage. As per Karnataka Town and Country planning Act 1961,section 25 CDP should be revised every 10 years. The first CDP plan was made in 1984. Let us not get into details of subsequent CDP plan made/revised for Bangalore city. Let me directly to Jump to Bangalore CDP plan. Bangalore CDP Bangalore Development authority is entrusted to prepare CDP 2031. As per BMR (Bangalore Metropolitan Region) following are the authorized civic agencies . Let me also explain about BMRDA. Bangalore Metropolitan Region Development Authority (BMRDA) is an autonomous body created by the Government of Karnataka under the BMRDA Act 1985 for the purpose of planning, co-coordinating and supervising the proper and orderly development of the areas within the Bangalore Metropolitan Region (BMR) which comprises Bangalore urban district, Bangalore rural district and Ramanagara district. 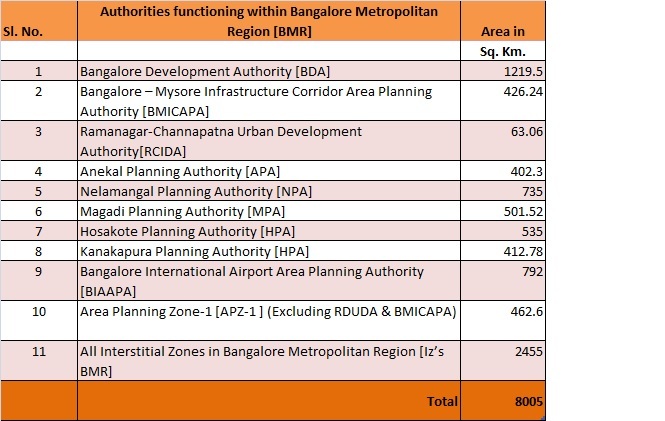 As per the Structure Plan, apart from BMA (BDA jurisdiction), the rest of the Bangalore Metropolitan Region [BMR] is divided in to five Area Planning Zones (APZ’s) and six Interstitial are proposed along the corridors, which are (1) Bangalore-Bidadi (2) Bangalore-Nelamangala (3) Bangalore-Devanahalli (4) Bangalore- Whitefield, Hoskote (5) Bangalore-Anekal, Sarjapur-Hosur. The Area Planning Zones (APZ’s) are areas where urban development is permitted subject to certain regulations. The Interstitial Zones are the areas lying between APZ’s where urban activities are restricted giving more emphasis to environmental – issues like conservation of forest area, agriculture etc. Till now the CDP plan was taking care mainly on change of land use and zoning regulations. Of course this is very much core area of CDP. We have seen many illegal residential layout built on Agricultural land and also industries. CDP will clearly define which are residential /industrial/green belt areas. Now CDP should clearly define and correlate its plan to various government departments like Electricity, Water supply, Telecommunication, Sewage and Drainage. Infrastructure. Industries and also Forest etc. Growing population, increasing vehicles, pollution and existing high density area of Central Business district are to be addressed from all angles. CDP does not mean plan for growing areas but also for unstructured developed areas of the city. But City needs one short term CDP /Emergency/Contingency plan to address immediate problems of public in 2014 itself. One should wait and see how ancillary use in residential areas will be handled by government. What are the hurdles BDA will have in Bangalore CDP 2031 process and implementation from legal point of view? What will be the role of MPC? (Metro Politan committee). How active participation of various citizen groups will help and guide through its think tank? I conclude saying how Bangalore CDP 2031 will address all issues in 8005 square kilometer area, only coming days will throw the picture on this.